Next Generation Sequencing has transitioned from a new and exciting technology with research potential to a robust and diverse assay with immediate clinical utility. We at Golden Helix have been building and maturing software solutions through this turbulent and innovative time resulting in NGS becoming a staple of our industry. With GenomeBrowse, we have built the world's best NGS visualization platform. We continue to evolve and expand the statistical and bioinformatics capabilities of our research-focused SNP & Variation Suite. Our collective experience and expertise has been folded into the core technology that powers these products. 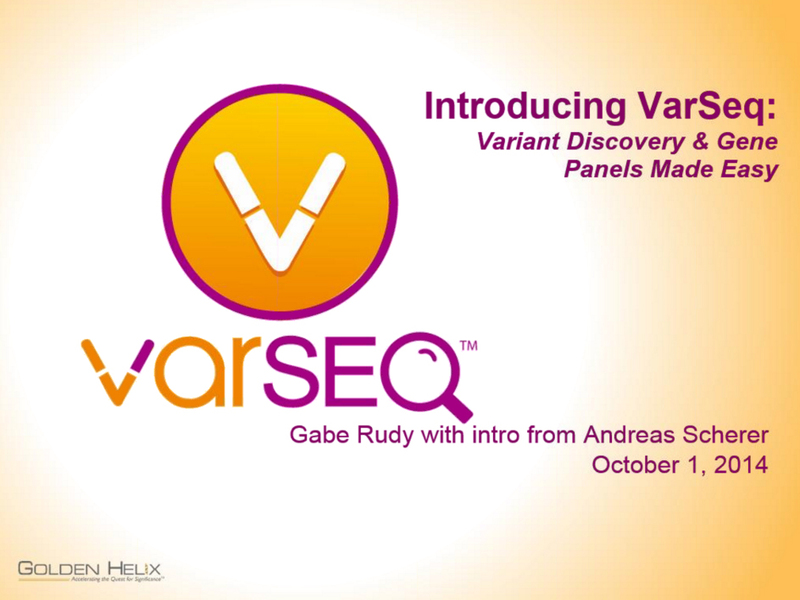 We introduce to you: VarSeq! VarSeq is a next generation tool designed around a focused and intuitive user interface for analyzing Next Generation Sequencing data, powered with the same mature Golden Helix core technology for data management, annotation, and visualization. Gabe Rudy Meet Gabe Rudy, GHI's Vice President of Product and Engineering and team member since 2002. Gabe thrives in the dynamic and fast-changing field of bioinformatics and genetic analysis. Leading a killer team of Computer Scientists and Statisticians in building powerful products and providing world-class support, Gabe puts his passion into enabling Golden Helix's customers to accelerate their research. When not reading or blogging, Gabe enjoys the outdoor Montana lifestyle. But most importantly, Gabe truly loves spending time with his sons, daughter, and wife. Follow Gabe on Twitter @gabeinformatics.